When I first saw One Deck Dungeon on Kickstarter last year, I wanted to play it because it looked like a quick, portable dungeon crawl with some depth. I didn’t have extremely high expectations for it, but it definitely looked interesting. 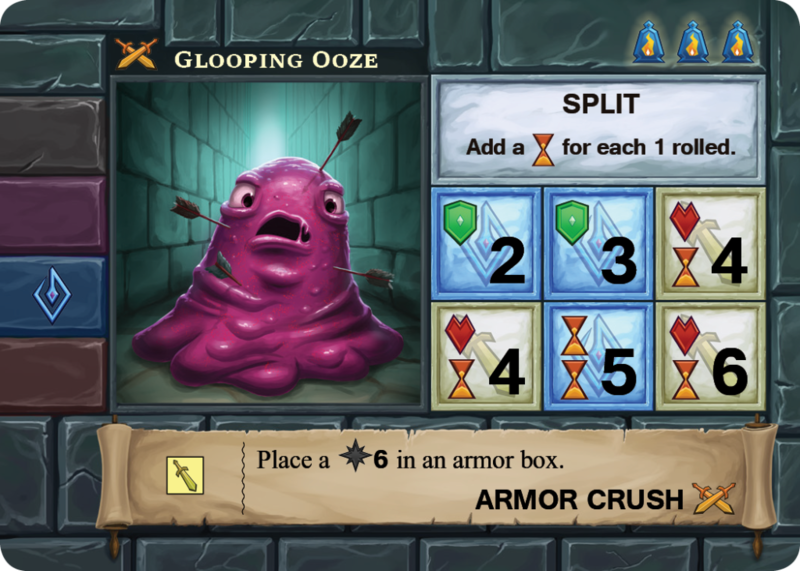 This One Deck Dungeon review is based on seven games (two solo and five cooperative). 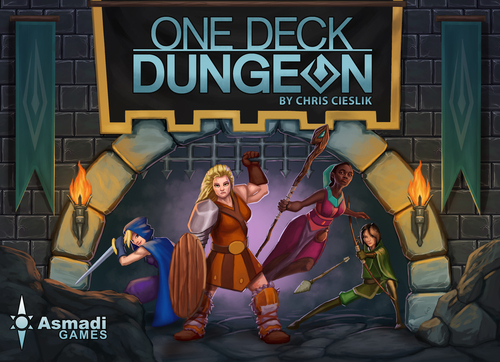 One Deck Dungeon is a solo or two-player cooperative dungeon delve by Chris Cieslik. You will be trying to make it through three levels of the dungeon and then, hopefully, take down one of the five bosses. The five heroes in One Deck Dungeon have their own unique stats and special abilities. The number of skill icons that you see on your card tells you how many dice you will be able to use for each skill. You use the entire encounter deck in every game, so you will shuffle that up and place it on top of the “Stairs” card, which tells you when you will have a chance to move to the next level of the dungeon. The encounter deck also doubles as a timer for the game as you will have to discard two of the cards before every turn. The encounter deck consists of combat encounters and peril encounters. The combat encounters have you fight monsters and you will need to match your dice to all of the boxes on their cards to defeat them. The peril encounters are similar to combat encounters except that you will be choosing one of two ways to attempt to get past them. If you are unable to cover all of the boxes on either type of encounter, you will suffer the penalties shown on the exposed boxes, such as losing time and/or health. Whether you successfully defeat the encounters or not, you will be able to collect the rewards on those cards. The three types of rewards that you can get are items, skills, and experience points. The items give you better stats, the skills give you new special abilities, and the experience points allow you to eventually level up your character. Leveling up gives you a chance to learn new skills, hold more items, get additional dice for encounters, and more. The bosses are similar to the encounters in the game, but they are much tougher. Once you get all the way through the dungeon, you will flip over the boss card. Unlike with the encounters, you will need to repeatedly attempt to defeat the boss. If you are able to drop the boss’ health down to zero, you win! You will lose if you (or your teammate when playing cooperatively) ever lose all of your health. The game also comes with campaign sheets, which allow you to level up your characters for future games. Gameplay itself doesn’t change at all, so it’s very easy to simply check off different boxes after each game and add those talents to your character before you start playing your next game. That’s a general overview on how to play One Deck Dungeon. If you want to learn more about the game, definitely check out the official One Deck Dungeon rulebook (PDF). Right away, I was a big fan of the choose-your-reward mechanism. I actually would have been fine with just one reward option, but having three takes it to a whole other level since you have more control over how you want to go through the dungeon. 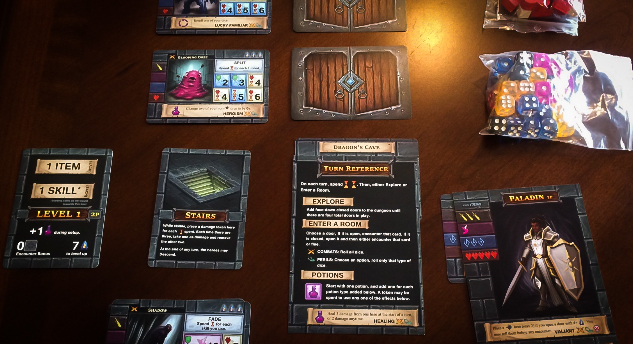 One Deck Dungeon is an excellent solo game, but it plays just as well as a two-player cooperative game. It’s not just a two-player solitaire game, either, as both players need to talk about which dice to use and which abilities will help the team get past the encounters. I believe this is the first cooperative fantasy game I’ve played that has an all-female cast of characters. We’ve complained multiple times here about games that could have had female characters, so it’s a nice breath of fresh air to see women representing these popular fantasy classes for a change. Oh, and all of the characters feel unique, which is also awesome. One Deck Dungeon is super tough even on the easier difficulty levels, but it never feels impossible. Trust me, that’s what you want to hear when it comes to co-op board games. There are times when your dice rolls work out, but more often than not you will need to accept your losses while also trying to find a way to level up to a point that you can win in the end. The game was designed so it can be played on a desk or other smaller space. The designer did this by making the encounter and boss cards fit underneath the hero cards and the reference card, respectively. This makes One Deck Dungeon the perfect vacation game or one that you can easily play at a coffee shop or restaurant. It also makes it very easy to see everything that’s currently going on in the game. This was not a problem for me in any of my playthroughs, but you definitely could run into the “alpha player” problem in this one. Since every bit of information is out there for everyone to see, one player could take over and make all of the decisions. There is a solution to that problem, though: Don’t play One Deck Dungeon with those types of gamers! I did have a couple of hero-encounter interaction questions that weren’t clearly covered in the rulebook, but I had no problem finding them online. I like One Deck Dungeon a lot more than I thought I would. It’s not one of those tabletop games that you play four or five times and it ends up on your shelf for months. It’s easy to learn and teach, it’s quick, the theme comes through well, and it’s very challenging. Don’t be surprised if it ends up on our list of top two-player cooperative tabletop games very soon. Plenty of people will find something to like about One Deck Dungeon. If you like dungeon crawls, get it. If you’re looking for a small filler with depth, get it. If you’re looking for a solid solo game, definitely get it. If you’re not interested in any of those things, then you’ll want to avoid this one. If you do end up enjoying One Deck Dungeon, you might also want to check out the standalone expansion, One Deck Dungeon: Forest of Shadows. Thanks for taking the time to read our One Deck Dungeon review!